Today, we are excited to announce the General Availability of Azure DNS. As a global service, it is available for use in all public Azure regions. We announced the Public Preview of Azure DNS at the Ignite conference in May of last year. Since then the service has been used by thousands of customers, whose valuable feedback has helped drive engineering improvements and to mature the service. With this announcement, Azure DNS can now be used for production workloads. It is supported via Azure Support, and is backed by a 99.99% availability SLA. As with other Azure services, Azure DNS offers usage-based billing with no up-front or termination fees. Azure DNS pricing is based on the number of hosted DNS zones and the number of DNS queries received (in millions). General availability pricing applies from 1 Nov 2016, until that time the Preview pricing discount of 50% continues to apply. 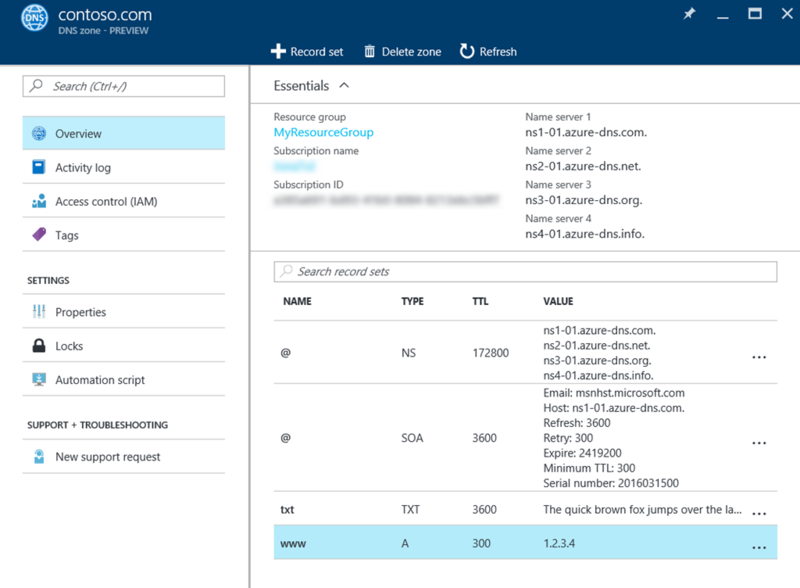 Azure DNS enables you to host your DNS domains and manage your DNS records in Azure. Easy migration – Migrating your existing domain hosting to Azure DNS is quick and easy using our zone file import feature, which enables existing DNS zones to be imported into Azure DNS in a single command. This feature is available via Azure CLI on Windows, Mac and Linux. Fast record propagation – When you create a new DNS record in Azure DNS, that record is available at our name servers in just a few seconds. You can verify name resolution and move on to your next task without having to wait. Record-level access control – As you would expect, Azure Resource Manager’s role-based access controls can be applied to restrict which users and groups are able to manage each DNS domain. In addition, these permissions can be applied on individual DNS record sets. This is particularly useful for large enterprises, in which shared zones are common, enabling different teams to self-manage their own DNS records without having access to records owned by other teams. Men & Mice is a leading supplier of DNS, DHCP and IPAM (DDI) software solutions for enterprise networks operating on diverse and distributed platforms. Deployed on top of existing network infrastructure, the Men & Mice Suite consolidates hybrid environments and offers comprehensive tools for managing large portfolios of DNS domains and IP address blocks, via a powerful user interface or via the robust Men & Mice APIs. 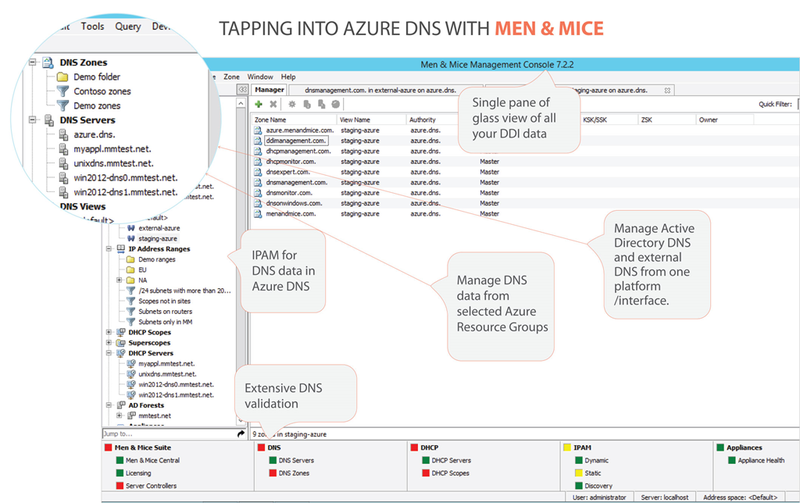 The Men & Mice team has been working with the Azure DNS team during the Azure DNS Preview to implement full support for Azure DNS in the Men & Mice Suite. This combination offers customers with large domain portfolios the flexibility and power of the Men & Mice Suite for large-scale DNS management together with the low cost, convenience, availability and performance of hosting their domains in Azure DNS.